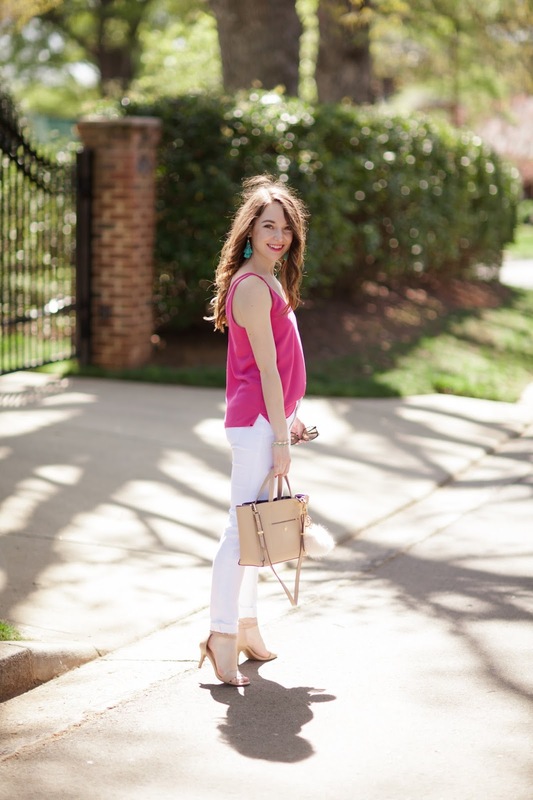 To all of my fellow vertically challenged ladies, I am rounding up a few of my favorite pairs of white jeans! I used to get most of my jeans hemmed, but I have found a few pairs over the last year or so that did not need to be altered. For reference, I am 5'2" and I typically wear a size 24 or 25, depending on the brand. I bought these about a year ago, in a size 24. They have also been in the following outfit posts: one, two, three, four, and five. They are pretty affordable at $59. I cuff them a little for wedges and heels, but for me they do not need to be cuffed with flats. I would say they are a mid-rise style, I typcially prefer high rise, but I love this pair. However, are not the most comfortable. They are rather tight, if you are looking for a very "skinny" jean. As I mentioned in this recent outfit post, I just found this pair last January. They are normally a pricier pair of jeans ($178), but I found them for an amazing deal of $20 at Nordstrom Rack. I also wear a size 24 for this pair. They have a raw hem, and I only cuff them once so the hem is still visible. This pair has a slightly high rise fit, which I always look for. I think that always makes for a better fit on me, and make your legs look longer. They have a bit of a looser fit through the leg for a skinny jean, and are quite comfortable. I only own this pair in regular denim, but they are also available in white. I have worn them in this post, this post, and this post. I found them for a very nice deal, I think they were marked down to $37 about a year and a half ago. I wear a 24 in these as well, but I cuff them a little more than other pairs of jeans I own. They are also available in petite sizes, and in a cropped version, which are sometimes the perfect length for me. These are also a high rise fit, a little higher than the Citizens of Humanity pair mentioned above. I think they are also a little more of a straight leg than a skinny jean, and are the most comfortable jeans I own!